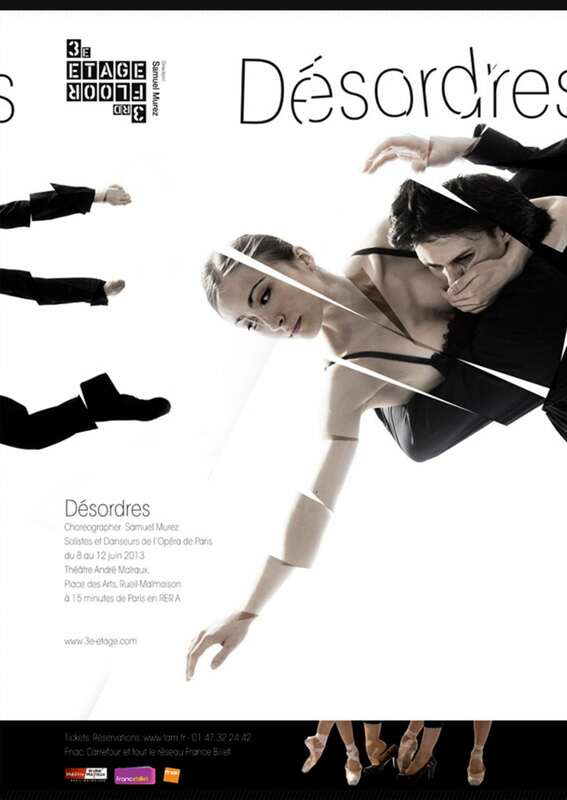 3e étage is a group that highlights the singularity of some of the most exceptional dancers from the Paris Opera Ballet in ingeniously structured shows, which allow them to unleash the full range of their prodigious capabilities. Poster Design for 3e étage. A group of Soloists and dancers from the Paris Opera Ballet. Disorders the troupe’s flagship program. Poster Design for 3e étage. A group of Soloists and dancers from the Paris Opera Ballet. Under the direction of choreographer Samuel Murez, these exciting artists bring a playful sensibility and irreverent touch to performances that take the spectator from classical masterpieces such as “Swan Lake” to acclaimed original works like the whimsical “Epiphénomènes”, as well as pieces by master choreographers such as William Forsythe and Roland Petit. The group’s distinctive blend of excellence and fun, virtuosity and self-deprecating humor has become 3e étage’s signature, and caught on with spectators and critics alike..